Some of the links in this post are affiliate links, which means that if you click on one of the product links, I may receive a small commission. This helps me to support my blog and allows me to continue to make free content. I only recommend products that I have used and loved or would purchase myself. Thank you so much for your support! Planning the nursery for our little guy has been one of the harder design projects that I’ve ever tackled. I think every designer struggles with her own home because we love all the things. It’s always been so hard to narrow down everything I like in order to focus on one direction. This nursery was no exception. Since moving into our new house (see the before photos here), we’ve painted all of the main areas, trim and walls, in Benjamin Moore White Dove (OC-17). I love this particular white because it has a creamy undertone with just a touch of gray. We’ll be painting the nursery White Dove as well to create a bright neutral background. I am fully aware that I am designing this nursery more for me than for the baby, and it’s important to me that the room flows with the rest of the house. I decided to start the design concept by finding bedding that I loved to use as a jumping off point. I created several themes around adorable bedding combos, none of which felt perfect to me. Then I stumbled upon this quilt from the Ace and Jig line at Land of Nod. I loved the combination of black and white with the bright blue and red and the tribal/boho/vintage print combos. I’ve been really attracted to Ace and Jig’s women’s fashion lately, so finding this bedding seemed like kismet. While I was still debating the color palette and design concept, I drafted the floor plan. The room we’re using for the nursery is on the first floor next to the master bedroom. It has a south facing bay window which lets in lovely warm light throughout the day, hardwood floors, and an extra-large closet. I knew right away that I wanted to remove the closet doors and put the dresser/changing table inside the closet. The current closet setup is the basic shelf/bar, which is totally impractical for little people clothes. Since the closet is 3′ deep, I’m planning to add a custom storage solution with two rods and a few shelves, probably from Container Store, along the exterior wall. If we had more room in the budget, I would demo this closet completely and replace it with a PAX system from IKEA. Maybe for the next baby. By placing the dresser inside the closet, I was also able to make room for a daybed. I wanted to have a place within the nursery for visitors and Keegan to sit and relax. I found a reasonably priced option from Urban Outfitters and am planning to have a custom cushion made for it. Once I was committed to the Ace and Jig quilt, the rest of the scheme came together pretty quickly. I found a large wicker mirror at CB2 to anchor the main wall and a modern mobile for over the crib. The vintage arrow print is one of my favorites. I had it framed in natural birch with a linen background to coordinate with the other light wood finishes in the room and contrast with the white walls. I tried to select furniture that was reminiscent of mid-century modern design since we have several mid-century pieces in our living room. 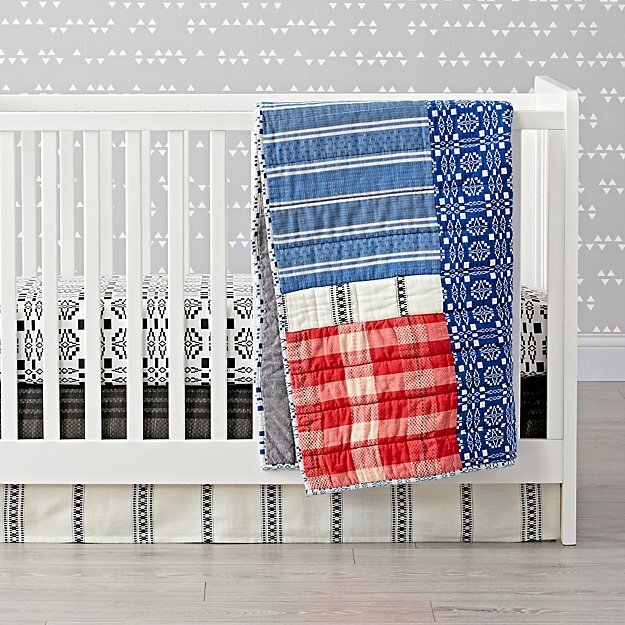 The Babyletto crib is a popular option that’s all over Pinterest. For the rocker, I knew I didn’t want a typical nursery style glider so that we’d feel comfortable reusing it in another room of our house at some point. Keegan requested one with a high back, though I loved this option. The dresser pictured is a vintage find on Chairish, but it’s a little over budget. Hopefully, I’ll find something locally that is just as perfect. So far, I only have the bedding, rug, and arrow print on hand. The rest needs to be ordered or purchased locally within the next few months. I’m definitely starting to feel the pressure! Stay tuned for process photos of the room as we start working on it over the next few weeks. Some of these links are affiliate links, which means that if you click on one of the product links, I may receive a small commission. This helps me to support my blog and allows me to continue to make free content. I only recommend products that I have used and loved or would purchase myself. Thank you so much for your support!